Lazy Liz on Less: Swing, Set, Go! Finally had the time to put the swing set all together. Still have to put my lattice and planter box for shade and neater look. I'm almost ready for Spring! Could you post the measurements for the A frame? sorry for late reply, please see last part of the post. I just added the dimensions. 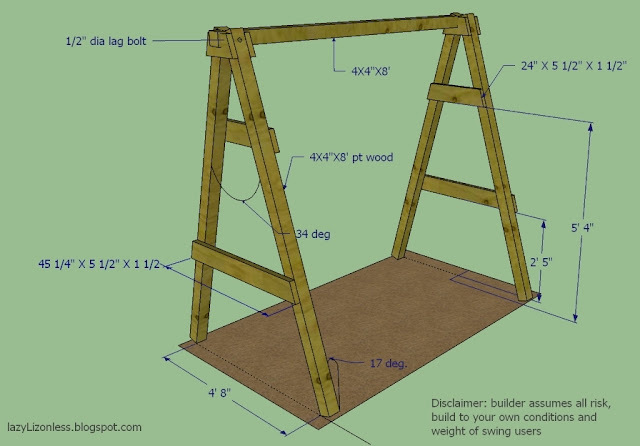 Can you post the directions for building the swing chair? Or direct where you got the directions from? Thanks! could you tell me what is the angel on the top of the legs where it bolts to the cross beam. thanks. Can you please tell me how much weight will the frame hold? We're there notches at the top of the vertical supports for the cross beam to sit on?